118 holiday Apartment Complex with a garden. Outdoor Pools - Studios and One and Two-Bedroom Apartments. Discounts for Online Booking. Each air-conditioned apartment has an well equipped kitchen or kitchenette, twin beds, safe, telephone, radio and satellite TV. 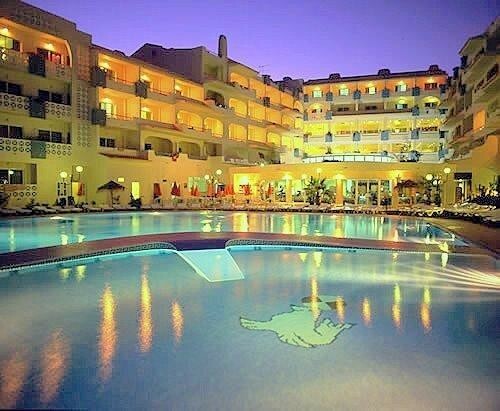 Set back from the beach and within walking distance of either the centre of Albufeira or the famous nightlife area named 'The Strip'. The Hotel has a large outdoor pool with a separate one for children. The facilities include is a restaurant and bar with evening entertainment, a separate snack-bar, and an outdoor area for children. The hotel also has conference rooms. 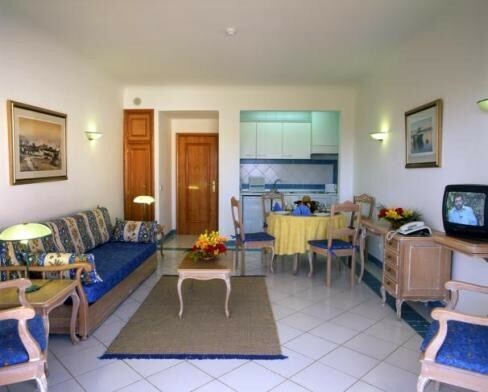 Spacious, open-plan studio and living area with a kitchenette, a satellite TV and a private bathroom. This apartment has a separate bedroom and living area with kitchenette, and a satellite TV. Each apartment has a private bathroom with free toiletries. This apartment has a separate bedroom and living area with kitchenette. It has a satellite TV and a private bathroom with free toiletries. This apartment separate bedrooms, and living area with kitchenette. It has a satellite TV and a private bathroom with free toiletries.